I have to give credit where credit is due. This was an idea that Ed (retroleds) came up with originally and I just kinda stole the ball and ran with it. 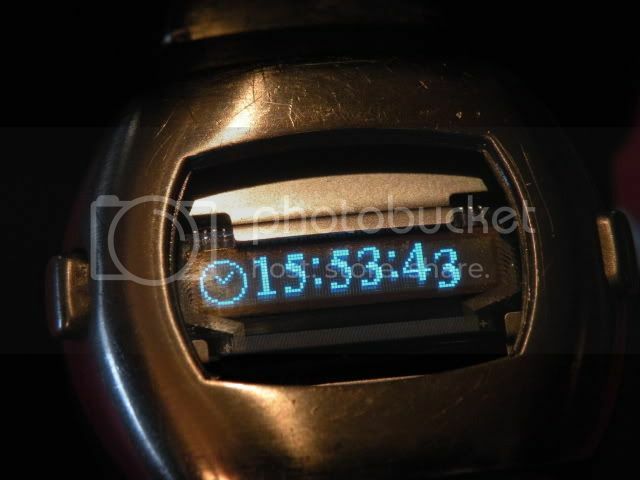 I purchased a stainless steel Date/Command on Ebay under the assumption that it was working. It was not. So now I have a dead module (which will be sent off to be fixed or become a hybrid), and a half decent case w/a crappy non-original bracelet. What to do??? Although the band looks original, it's not. I took it off one of my Space/Time Pulsar look-a-likes. 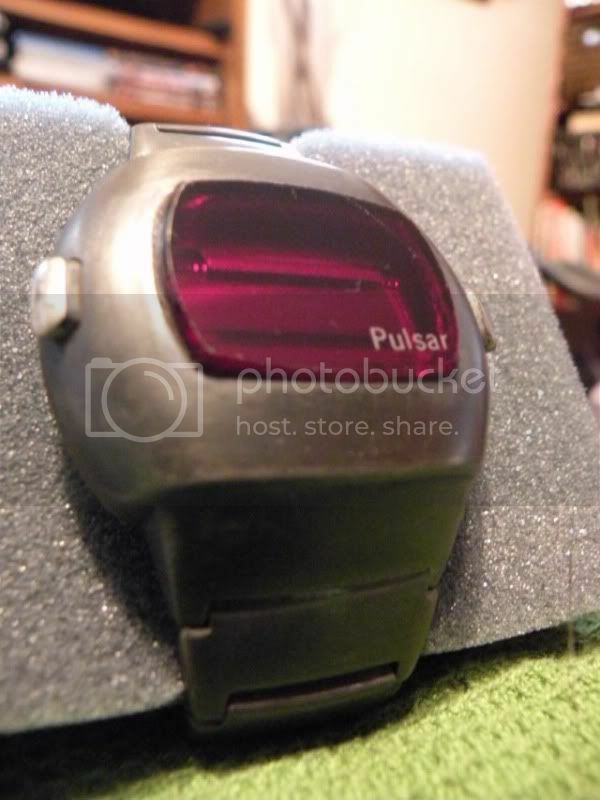 I just replaced the clasp with an original Pulsar one. All in all it turned out pretty good. The hardest part was soldering the reeds to the board. I broke one of them doing that. Also getting the reed the right distance away was tricky. I had to move the switch millimeters to find the sweet spot for both sides. The piezo alarm is currently not working, although I had it working outsided of the case. I will look into that. But now I have a vintage watch with a modern module. Last edited by Sully008 on 29 Oct 2009, 16:48, edited 2 times in total. It's an interesting "look", and it's a sure thing nobody will ever mistake this for an original Time Computer module. Don't know if they're available, but if they are, you might have considered doing this in blue. 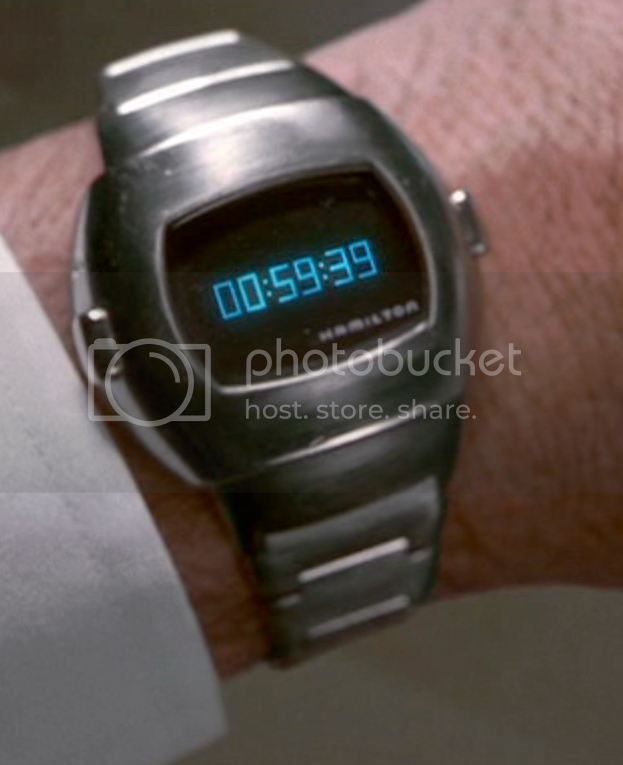 Then, it would have looked virtually identical to the updated, but vintage, P3 seen in MIB II. 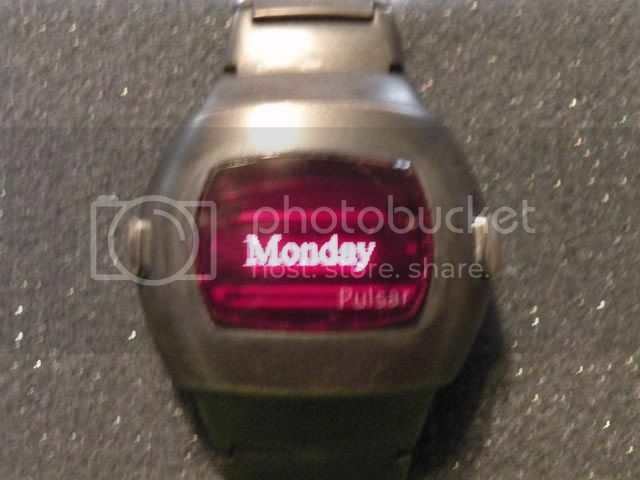 BTW, in the world of eBay, unless you see convincing pics, I never assume an LED watch is working... Also, I seem to remember a thread about somebody doing a P4 Exec in black chrome...THAT was a spiffy-looking watch! I thought of doing it in blue, but the only watch out there with the blue OLED is the Apus Infinity Dark Force, which sells for 169Euros. At that price, I'd rather have an authentic Date/Command. 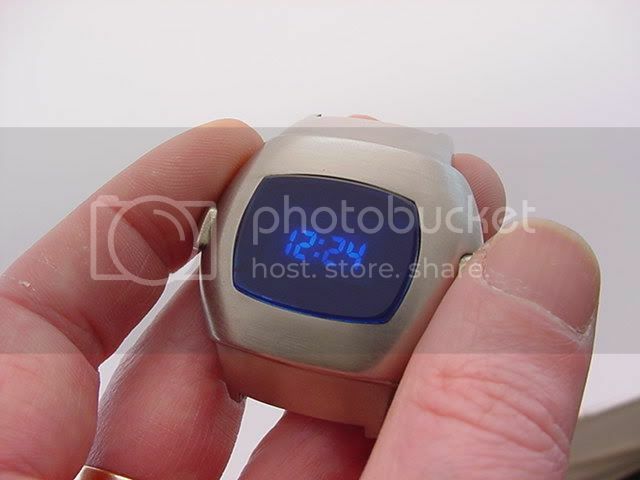 Also, I'd have to buy one of those TX4 blue LED watches to get the blue crystal and file it down to the correct shape. And still it would be cheap plastic, not glass. I've seen a picture of someone that did that already, using the cheap blue LED module. I could do it to an early Hamilton case, the glass from the Apus could be cut down to fit the rectangular hole of one of those. Hmmm. I've also seen pictures of a gold P3 with the green module. That looked sharp. bruce wegmann wrote: It's an interesting "look", and it's a sure thing nobody will ever mistake this for an original Time Computer module. Don't know if they're available, but if they are, you might have considered doing this in blue. Then, it would have looked virtually identical to the updated, but vintage, P3 seen in MIB II. 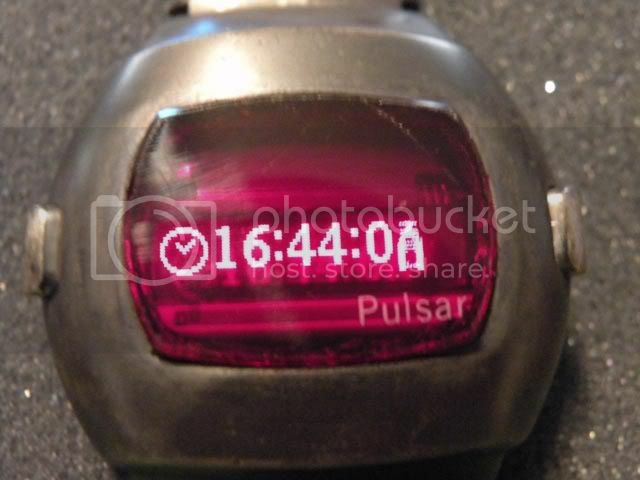 BTW, in the world of eBay, unless you see convincing pics, I never assume an LED watch is working... Also, I seem to remember a thread about somebody doing a P4 Exec in black chrome...THAT was a spiffy-looking watch! Very cool and unique project! There are a number of relatively nice Chinese made modern modules. 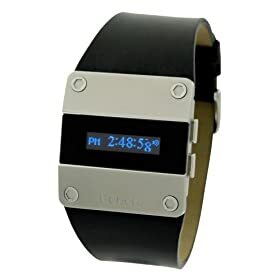 In terms of blue OLED, you could get a Bench or Lucky rebranded version of the Dark Force watch for As low as about $45US (http://www.overstock.com/Jewelry-Watche ... oduct.html). Another option might be the Fossil OLED modules, which display the time using an attractive and readable bitmapped font. My current favorite modern module is from the Aigo F029, which has a bright full color 160x128 pixel 1.3" display, a great MP3 player (sounds much better than my iPod or iPhone), photo viewer, AVI video viewer and a decent menu system. Sadly, it was only available (back in 2006) in a cheap plastic case. I did see those photos of the lovely green P3. If anyone has a photo or link to a photo of that black P4, please post it! Thanks for that link to overstock.com. I just bought one. That was even cheaper than the DKNY I bought. 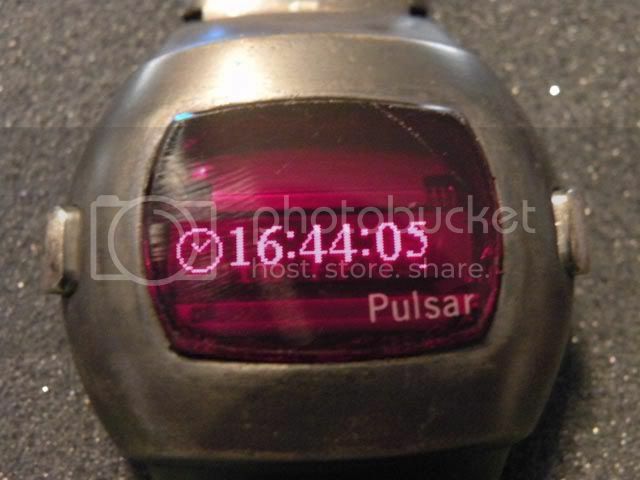 There may be hope for the MIIB blue Pulsar still! 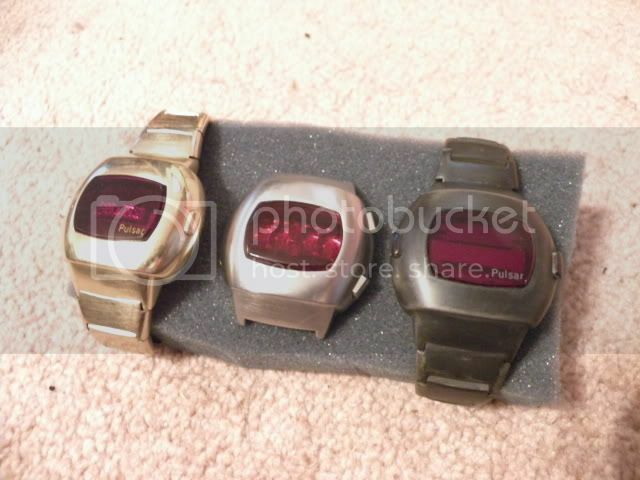 If Apple made an "iWatch" I'd be all over that. The nicest looking multimedia/phone watches in terms of design so far are the LG GD910 and the Samsung S9110. Neat - those comparison shots really show the color. It looks like something Darth Vader would wear! How did you blacken the stainless steel? Do you think the dark finish will hold up? It's too bad that stainless steel can't be anodized. Then again, for the sake of good taste, maybe that's fortunate. 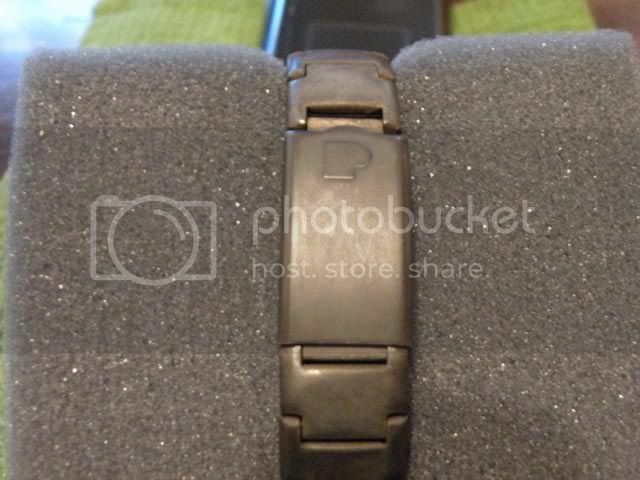 I used a product called "stainless steel blackener 370" from caswellcanada.ca. They say it can be used without the sealer they sell, but I'm noticing that the finish is wearing through in under normal use. I may buy the sealer and try again. It's okay for now, I like the beat up look. As for the blue project, I found a website that has blue transparent plexiglas samples in 3mmx100x75mm sizes. I'm going to order a couple of those to play around with. Now, to buy another SS Date/Command case. 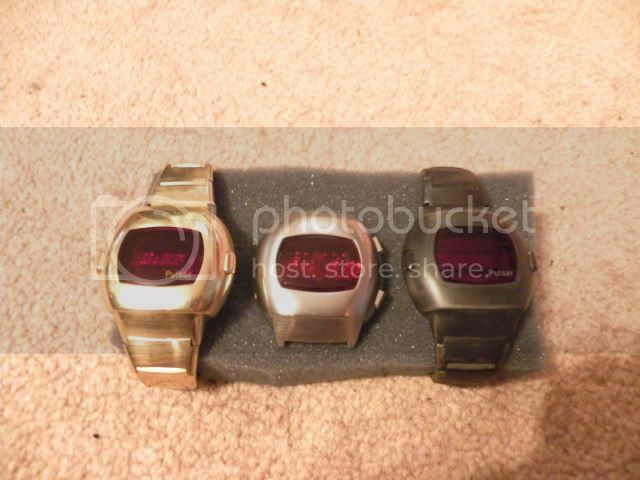 Anybody got one for sale?? abem wrote: Neat - those comparison shots really show the color. Are you sure it was a P4? I remember a black chrome Bulova by an Australian member (Andrew?) a few years ago. How did you grind down the plastic to the correct shape? Also, do you remember how thick the plastic was? I believe the plexiglass I bought will be anywhere from .09" to .125". It also looks like you needed to polish the lens, is that correct? Okay so I had to pull out my MIB2 DVD and get some screen captures of K's Hamilton. 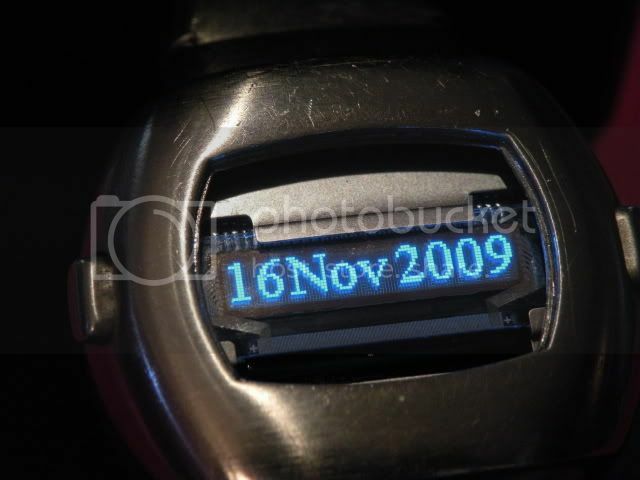 I'm so doing this with the blue OLED display and a SS Date/Command. It's funny, but the crystal looks to be red, I know they added the blue LEDs in special effects, but did they really make a crystal with the Hamilton script just for the movie? I don't remember but I think the plastic was the right thickness for the crystal, to get the shape I sanded out a rough shape then used double sided tape to stick it to an old crystal, then sanded down to that, then a bit of fine paper and some polish to get the polished finish. As you probably know a blue display wont work behind a red crystal, so yeah the one in the movie was special effects, I'd imagine the Hamilton text was also effects. This is something I'd considered for the Hamilton lettering.. 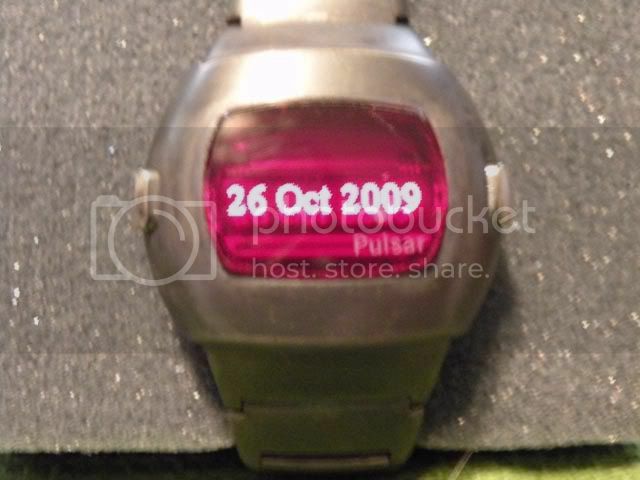 I do remember a fellow Antipodean doing something strange to a watch, but can't remember what he did, or who it was. 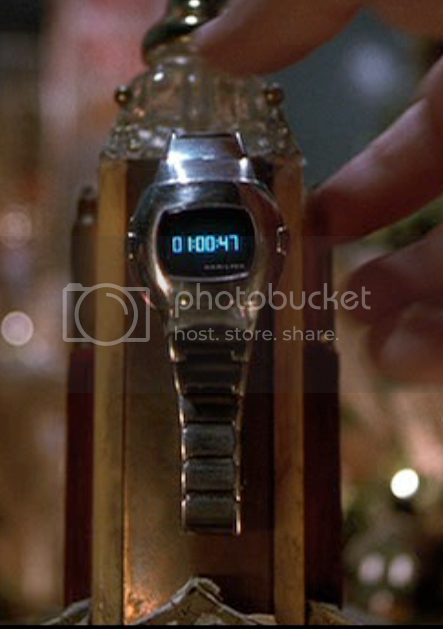 It was andyz4000 that did a black chrome Bulova Drivers watch. The only picture left is his avatar. It looks cool though. Last edited by bruce wegmann on 31 Oct 2009, 00:42, edited 1 time in total. It was easier this time around in getting the reed switches to work because of the lessons I learned with the red one. I also got the module more centered in the case. I'll probably go back and redo the "Vader" model because it's a touch low. I'm still torn on what color blue to use for the crystal. I have a dark blue and a lighter blue piece of plexiglass to work with. I think I'll make one of each and see which one looks better. The lighter one will keep the color closer to the movie, but you'll see the insides more. The darker one obviously makes the LEDs look darker, and hides the insides. Awesome work! You are(or should be) a real inspiration to the hands-on collectors, new and old. That DKNY module is "killer", glad I could help out. Hey, you didn't show us how you maxed it out some of the other details...I'm not telling, that's your baby. How about making a black mask around the display to hide the internals so you could use the lighter crystal material.